2018 says goodbye and Pantone has decided to leave behind Ultra Violet to welcome Living Coral. This season colour comes strongly, it is a colour that can incredible warmth in the rooms, even when combined with the coldest colours. According to Pantone, Living Coral transmits energy and optimism. It is a playful colour that favours shared experiences and social connection, something that due to technology and social networks seems to have lost importance. It is an elegant colour from the depths of the sea. Despite being very lively and effervescent, it creates a hypnotic effect that helps our mind relax. This tranquillizing effect is due to the connection with the sea transmitted with natural intensity. 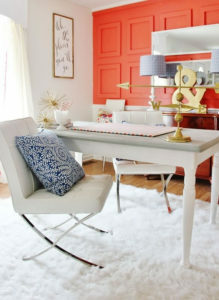 Instead of all or nothing the best way to make good use of Living Coral is in small touches. In decorative items, textiles, a sofa or painting a wall, these small details will be the perfect combination for your home providing freshness and vitality. Coral, being a warm tone, tends to be used during the summer. Pantone has confirmed that their inspiration has been the colour palette of a tropical paradise. So if you want your home to have that warm summer tone, using this colour with wood or green tones can be a real success. Although at first glance it may seem a difficult colour to combine, there is a wide range of possibilities. The simplest is to combine it with neutral tones, but for the more daring it can also look perfect with shades such as dark grey, light blue or turquoise. Living Coral has many possibilities, and not only in the living room of your home that would be the most common. 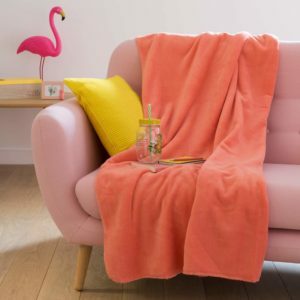 Trying Coral for a bathroom or a kitchen is completely doable, you can start with some textiles or accessories, but having a piece of furniture or a tiled wall in this tone will make your rooms look incredible.